Today I’m sharing with you the pictures from my clients recently renovated kitchen. I’ve included some tips and easy ideas when designing a light and airy kitchen space. Above is a close up shot of the small empty corner they had in the kitchen which I turned into a little breakfast spot. 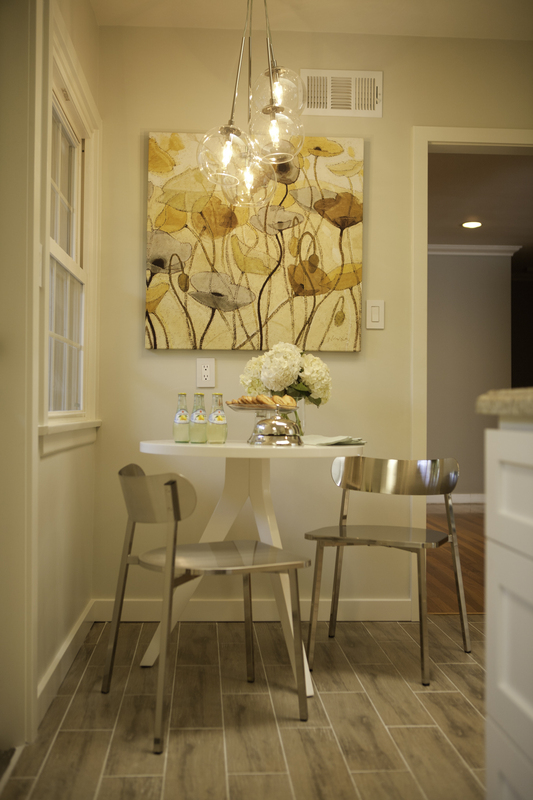 I installed a beautiful glass light fixture over a white table and sleek stainless steel chairs. A piece of modern art bringing in some color makes this a perfectly cozy spot for breakfast snack.I used a light color palette to accentuate all of the light in the kitchen. 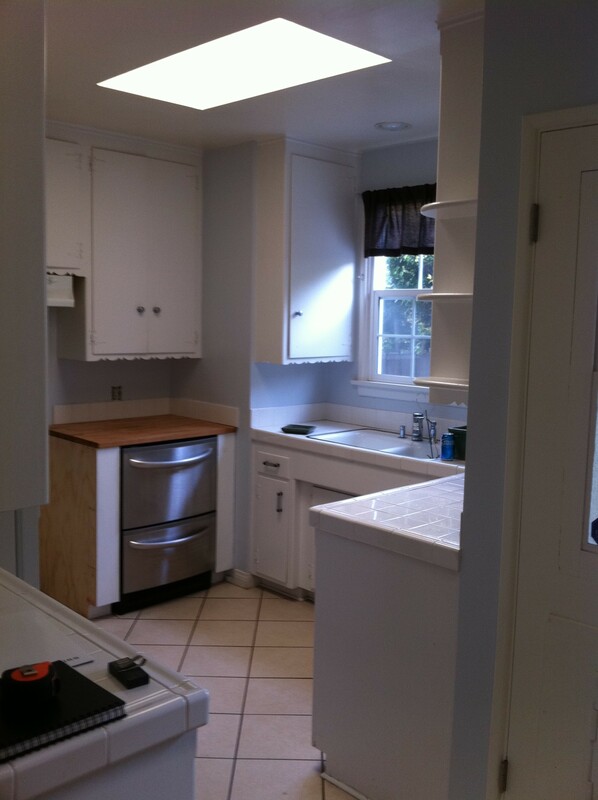 Although the kitchen wasn’t HUGE to start out with, I highlighted its best features…. A fantastic skylight and high ceilings!! 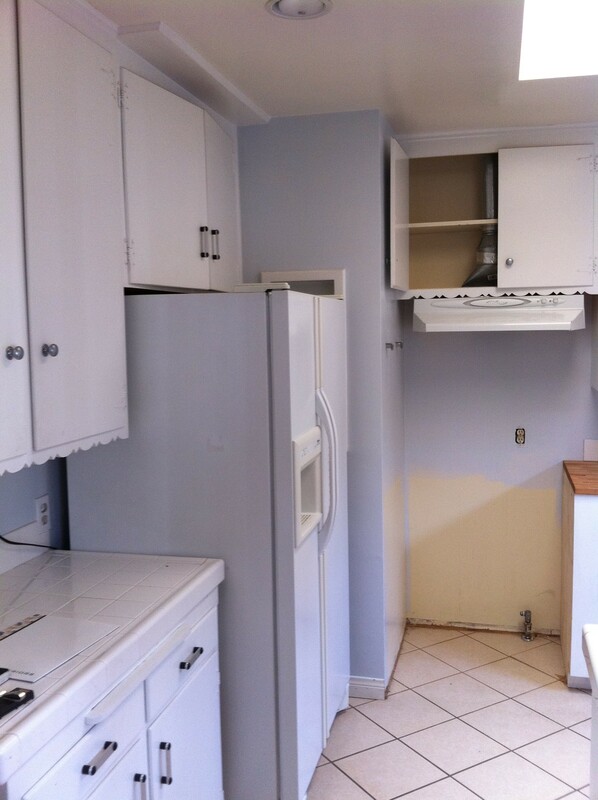 Originally this kitchen had the laundry machines and water heater taken up the majority of the space. So in its place I’ve built in a large butler’s pantry for additional wine storage as well as this glass door pantry where the old water heater used to sit. The original floor plan also had two corners in the kitchen taking up useful space due to closets on the opposite side of the wall. Luckily, we were able to completely remove those closet spaces and make the cabinetry continue without any unwanted interruptions! Check out these BEFORE photos… I warn you the difference is shocking! As you can see, the corner where there is unproductive space! Okay, now back to the pretty stuff! To keep this style contemporary and clean, I used Shaker Cabinetry Doors finished in a fresh, bright white. The muted color palette was chosen to highlight the light, bright and airy feel I hoping to achieve. 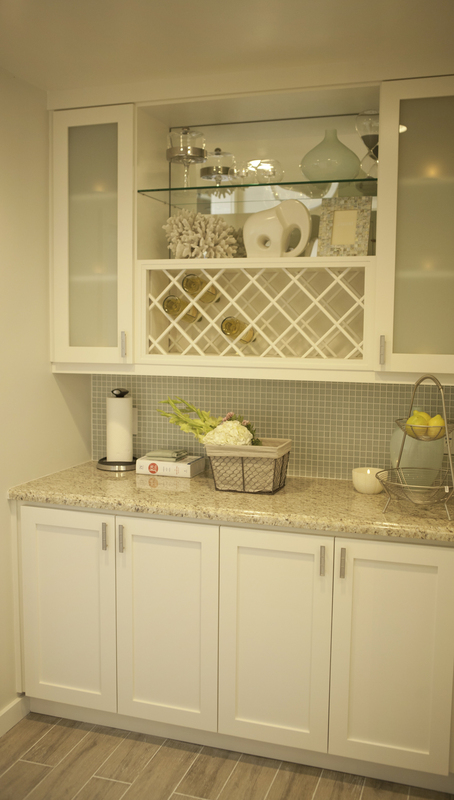 To get an airy look, frosted glass was chosen for parts of the pantry. A few added touches of decor gave this kitchen a personilzed finished on the remodeling. Other materials in this kitchen include porcelain tiled flooring. The various colors of the floor work well with the lightness of the kitchen but also bring contrast to the space. I used stainless steel appliances to complete the contemporary look of the kitchen. Not only that, but the appliances completement the stainless steel chairs in the sitting area. 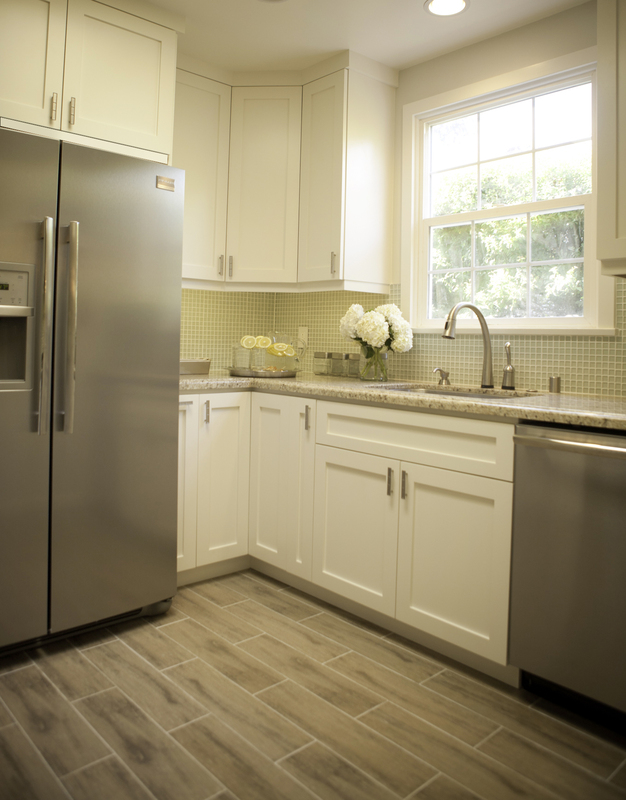 For the backsplash, glass tile in a fresh green hue was placed to complement the breeziness of this newly renovated kitchen. 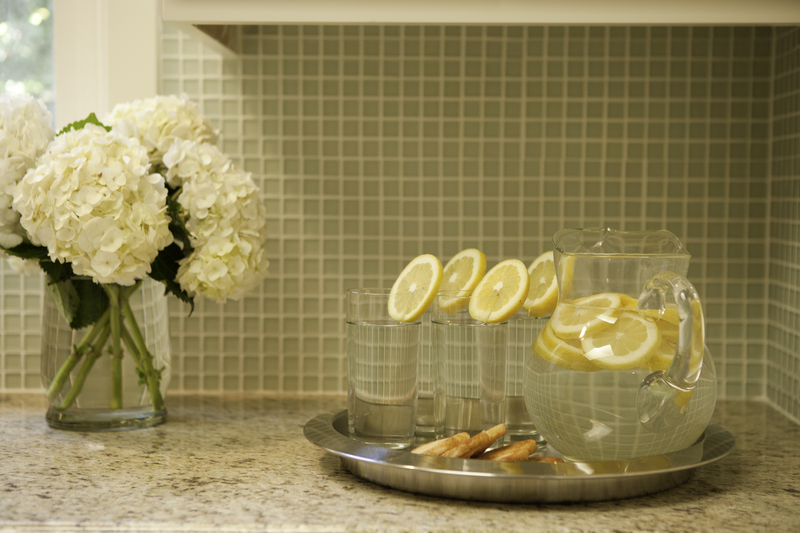 Doesn’t this space make you want to sit down and enjoy a fresh glass of lemonade!? So excited for Missoni at Target…ARE YOU? We are so excited that the fabulous luxury line Missoni has teamed up with Target…. and it looks likes everyone else shares in the excitement. So far Target reports that their website crashed because of all the interest for the Missoni products. Goes to show people crave good design!! GO Target!!!! Today our blog post comes from a guest writer. Thank you so much Brandon! Hope everyone enjoys!! Themed children’s rooms are very popular right now. Hollywood stars are decorating their children’s rooms in popular themes. Design and room makeover shows on HGTV regularly show fancy-themed children’s rooms with custom designed beds and other elaborate elements for kids. There are websites and specialty stores that specialize in themed children’s rooms, but even with those resources, how can you create a space for your child that they are sure to love? The room should have a sense of harmony and balance. The room should express a mood. The room should be functional. When designing a child’s room, it is important to not get too carried away and throw off the balance with too many items. It’s so easy to get caught up buying a ton of accessories that go with a particular theme, but then have no real plan in place for them. A room put together that way will most likely feel out of balance and cluttered. Instead, choose your accessories with a purpose in mind. Accessories can be a great inexpensive way to add to the theme your son or daughter has selected for their room, but be careful not to go overboard. Stick to just a few well-placed accessories to bring the theme you have chosen to life. Decorating is supposed to be fun, and not just another item to cross off a to-do list. Take the time to enjoy the experience and involve your child in the process. This is a good opportunity to teach them about decorating and making their room reflect their personal taste and needs. Here are some tips to help you with the walls and furniture choices in a child’s room. Painting walls and applying wall decals or murals are both inexpensive ways to change the look of your child’s room and create a definite mood. Wallnutz carries mural painting kits (stencils and paint-by-number) that allow you to customize a room. Murals allow you to cover great amounts of space and add customized features. Wall decals can be found in just about every possible color, character, theme, or shape you can imagine. Fathead and RoomMates are two popular sites for peel and stick decor. And the best thing about decals is that they come off without damaging your paint. For the picky child, or kid that changes their mind all the time, wall stickers are a great, inexpensive solution to painting projects. The most obvious choice for accessorizing your themed room with furniture is going to be the bed. It’s most likely the largest furniture piece in the room and as such, can be a great focal point. A themed comforter or some throw pillows are the typical route. An engraved head board can add a lot of fun. To go a step further you can look for beds shaped to fit your theme. The archetypal choice is the racing car, but a pirate ship or boat bed from Olivia and Will has a lot to offer too. Adding a dresser, shelf or desk that maintains the desired theme is a must. Decorating a child’s bedroom doesn’t have to be a dreaded task. With a plan and some compromises between you and your son or daughter, you can create a room they love without costing you a fortune.